Posted in Nylon Sequins Fabric	| Comments Off on Striking Sequins! Abstract Diamond Sequins Power Mesh Fabric combines the glitter of sequins with a delicate diamond pattern. Thin, straight lines interspersed with carefully chosen swirled shapes are what makes this fabric stand out and gives it its flair. The sequins sparkle like little dew caught in a spiderweb. 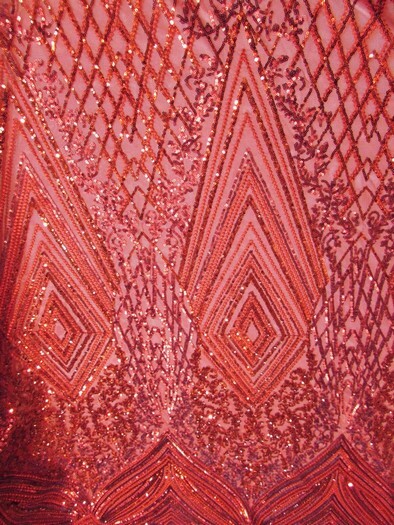 Rather than drawing attention to individual sequins, their small size produces the effect of glimmering strands sewn onto cloth. Incorporate this fabric into your next project and really make it shine. This fabric would be wonderful for a shimmering evening dress, skirt, or to add decorative touches around the house. It would also be a good choice as trim on a less vibrant fabric. This fabric comes in 7 colors, including Red, Hunter Green, Dusty Rose, and Coffee. All are wonderfully glimmering options. 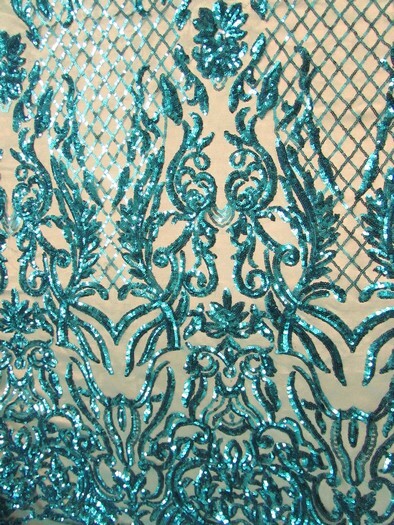 The width of Abstract Diamond Sequins Power Mesh Fabric is 52/60 inches. It is made of polyester, has a power mesh backing, and finished edges. It also has a two-way stretch. This fabric sells for $24.99, but samples are available for $1. If you need a fabric with some glitter to it, this is your chance!